We are a family run firm of Chartered Accountants based in Reigate, Surrey, providing accountancy services and tax advice for individuals and companies. We are members of the Institute of Chartered Accountants in England & Wales, and the Chartered Institute of Taxation. 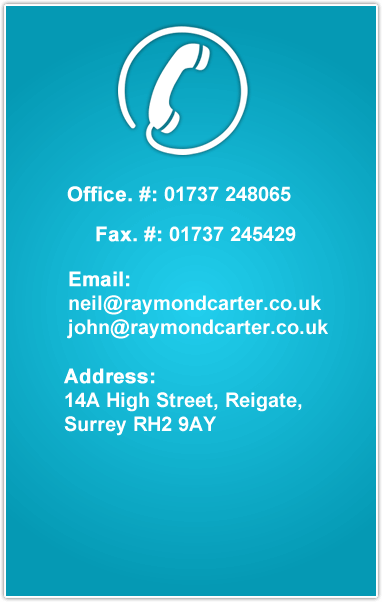 Raymond Carter & Co is a family-run firm of Chartered Accountants based in Reigate, Surrey. Established in 1971, the business provides services ranging from clerical support and bookkeeping, the submission of self-assessment tax returns and corporation tax returns, to specialist tax planning and advice. Our clients include individuals, small businesses, trusts and charities.